It was a cold overcast day in the spring of 2003. As I was sitting in church it was announced that 4 year old Les Fountain had brain cancer. His mom and dad, good friends of ours, were sitting across the aisle from us. It was also announced that the church had lost another board member and might have to find another location to meet. The attendance had dropped from over 600 a few years before, to less than 100 people. As an usher, I knew the doors would soon be locked… for good. Here was an innocent little boy, diagnosed with cancer in his brain and in his spine. They could could remove the tumor from his brain, but the spinal cancer was inoperable. It just seemed hopeless. The church was barely hanging on, with just a small remnant of the former members keeping the doors open. It seemed like every week there were fewer and fewer people. The original pastor had left to start a new ministry, and the replacement pastor was really struggling. I couldn’t see any solutions. I remember talking with God that day. I had a lot of questions. I started praying, but I didn’t see any way out. My mind kept telling me it was impossible. Over and over, my mind would churn. Why a 4 year old boy? As the year went on things got worse. The pastor resigned, and poor little Les who was recovering from surgery was now facing incredibly difficult and painful chemotherapy. I felt so bad for him and his parents. I couldn’t imagine what they must be going through. Then one fall day, it all seemed to come apart. Another Sunday morning with a guest pastor. Now there were only 50 people left. The church board was now gone. Little Les had lost all his hair and was very very sick. On that dreary day it seemed like the end was imminent. I prayed again, yet this time my faith was tested. It was like all of our prayers had gone unheard. I remember putting my head in my hands and feeling so alone. Where was God in our time of need? I looked over at Little Les and his parents who were sitting across the aisle from me. He had on a knitted cap that his grandma had made for him. You could see the large scar on his neck where the surgery was. As I looked at him something strange happened. Through his pain, he smiled at me. It was right then that I knew it wasn’t hopeless. What I didn’t realize, was there was someone sitting a few rows behind me that God had sent our way that day. A fellow named John Hansen and his wife Ann. They were visiting that day and thinking about taking over the leadership of the church. 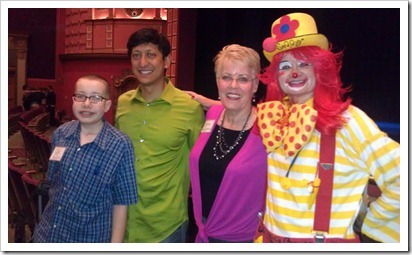 Within months, John Hansen became our pastor and Little Les went into full remission. 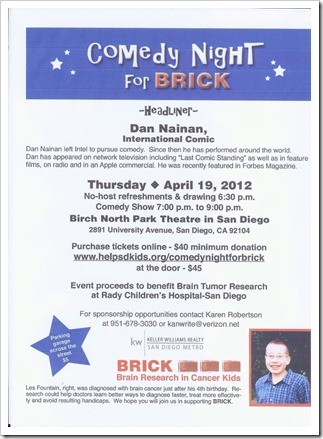 Last night, 9 years after his first diagnosis, I had a chance to celebrate with Les and his family at a comedy night in San Diego to raise money for cancer research. 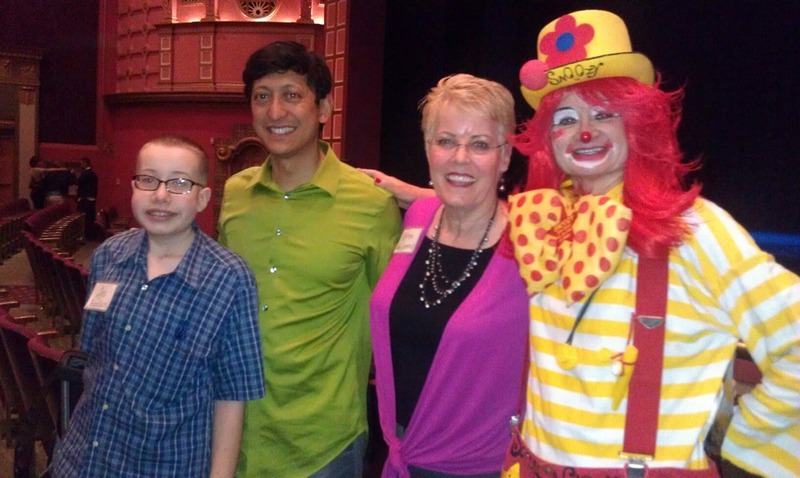 One of Les’s Grandmas, Karen Robertson, put together the event and brought in comedian Dan Nainan from New York. It was a great time of fun and laughter. 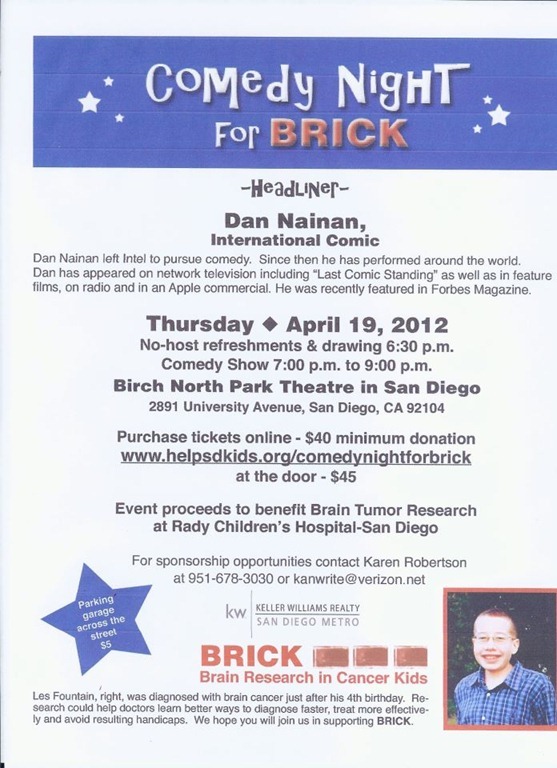 The event brought in donations for Brain Tumor Research at Rady Children’s Hospital in San Diego. Les Paul Fountain, who is now in middle school, was there with his signature smile. I talked quite a bit with his parents and asked them how their church was doing. They said that there were 2900 people there this Easter. Through it all, I’ve come to believe in the impossible. When our problems are bigger than ourselves, it’s time to reach out to others, and a time to pray. Impossible Things Do Come True. Question: Do You Have An Impossible Dream?